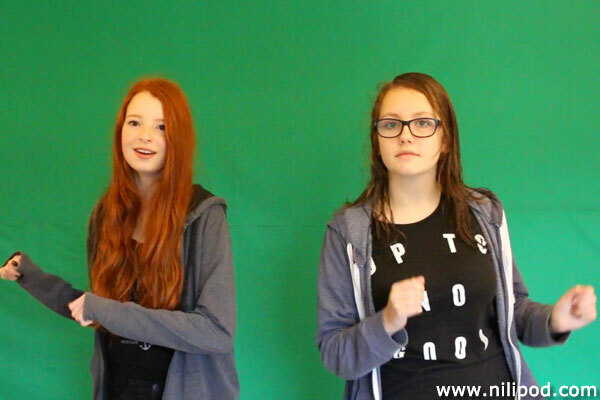 Every now and again we get out our green screen so that we can make some funny videos, where we change the background. This is basically just a huge sheet of material that is a particular shade of green. We bought it from eBay and it was quite cheap, but because it is so large, it is quite difficult to fix it to the wall without any creases. So what we tend to do is put it up the night before and mist it with some water, so that it hangs better and then the creases and folds drop out. When we film against a green screen, we find that to get the best results, you need to stand roughly a metre in front of the background. This allows the camera to focus on us in the foreground, making the material behind a little blurred, which makes it easier to remove when we edit the video on the computer in iMovie. We filmed our Christmas video called 'The Snowball Song' in this way, replacing the green background with lots of festive and wintery images. Have you watched it yet? Sing along and join in the actions, and tell us how you got on!